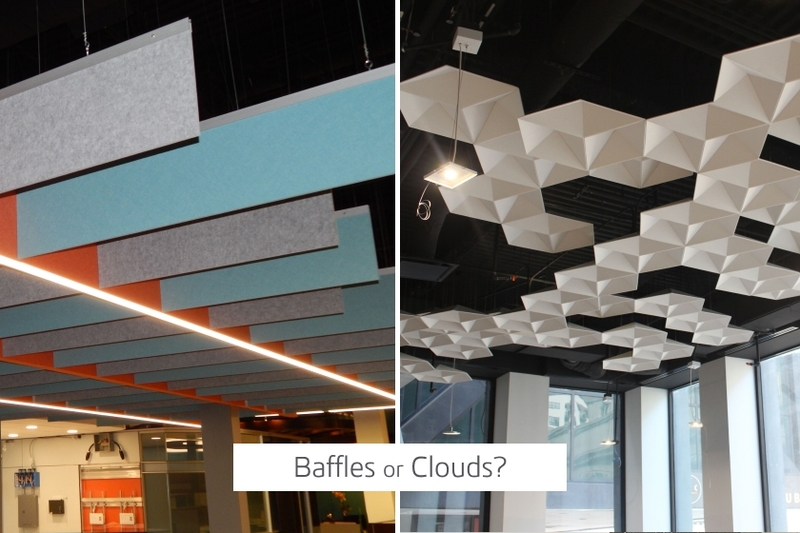 At Kirei, we’re asked on a daily basis whether baffles or clouds are the better acoustic ceiling treatment. The bottom line is that both are effective options, however, there are certain environments where we recommend the use of one over the other—regardless of personal preference! Let’s take a step back. First, why do ceilings need acoustic treatments? Think of a flat ceiling as the fifth wall in a room. 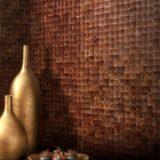 Just as bare walls will bounce sound back into a room, a bare ceiling will do the same. Some common ceiling features such as hanging lights and fans will passively help to control sound. 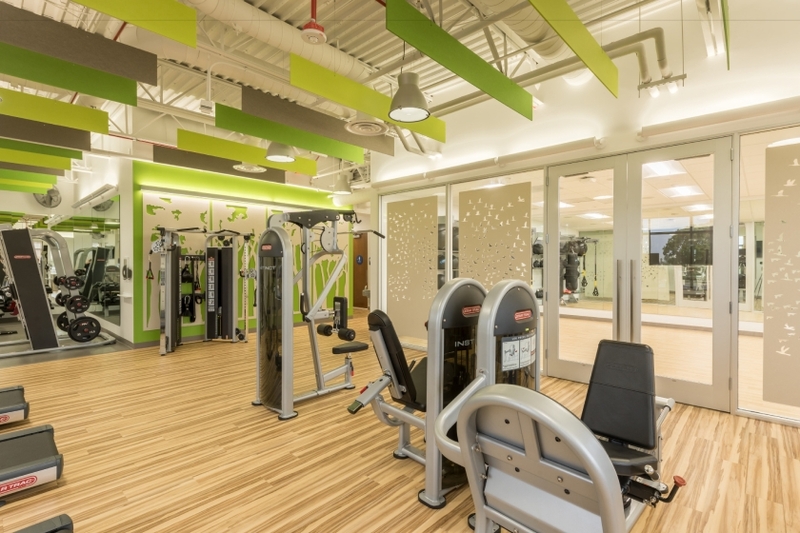 These may be enough for average-height rooms, but most commercial spaces require ceiling-mounted or suspended products that are specifically designed to control noise overhead. That said, there is no one-size-fits-all solution for such a wide range of applications, such as enclosed rooms, dining halls, open plan offices, conference rooms, or large lecture facilities. 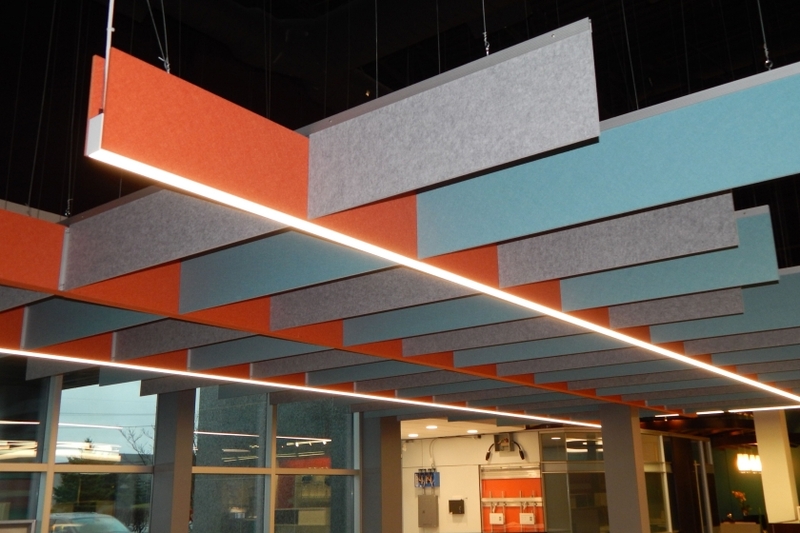 Unlike full ceilings, baffles and clouds are installed in specific places that need acoustical control. 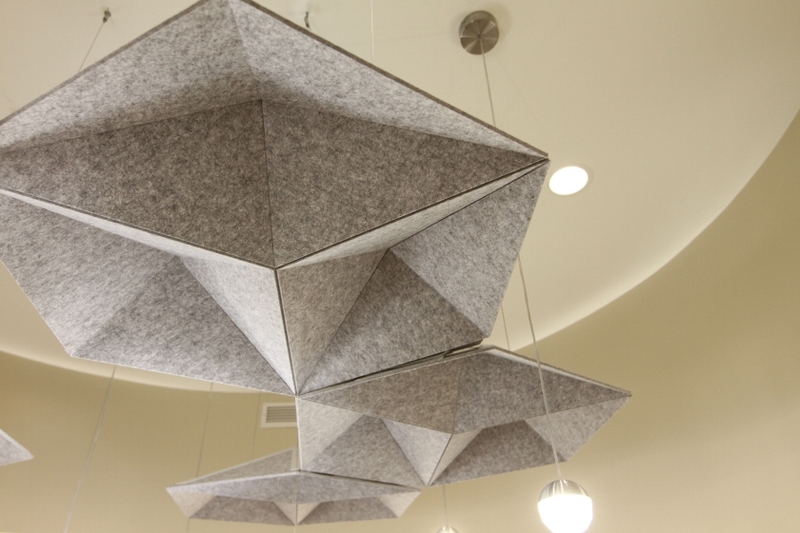 Placing acoustic products on a ceiling is a strategic endeavor and it varies on a project-by-project basis. Obviously, broad, large coverage will result in the best acoustical absorption. However, different factors such as the budget, the design concept, or other elements out of your control may require you to get creative. If you can’t cover the ceiling completely, then our advice is to cover it strategically. 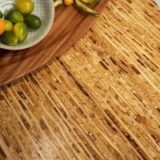 Don’t resort to traditional, bland ceiling tiles. Baffles effectively absorb sound, and most importantly, offer better style and can be customized to work in a wider range of spaces. There is a misconception that architects tend to place baffles in places that are less aesthetically pleasing. This is not the case! When done right, baffles can remain hidden in plain sight and keep the focus on the key design features in the space without disrupting the flow or aesthetic. When specifying baffles, the spacing is arguably the most important factor. We’ve seen projects where the first pass simply didn’t have enough baffles so it had to be re-done to tighten up the spacing. 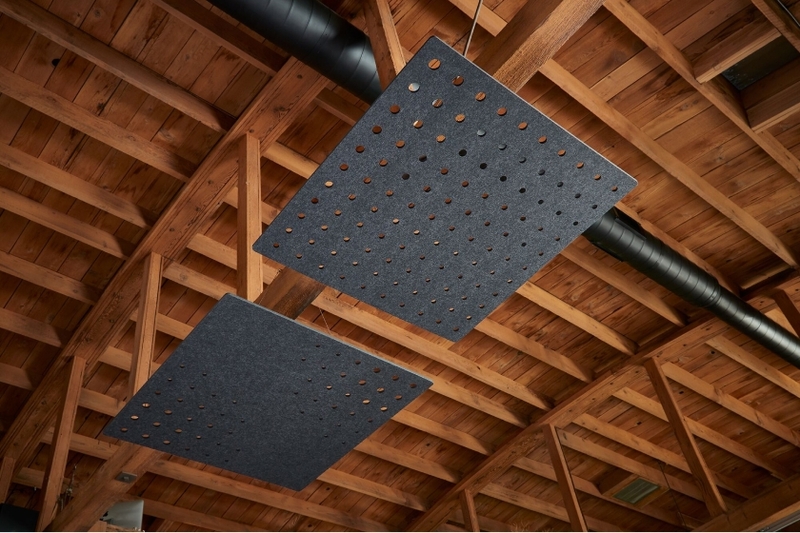 Many want to space baffles every three feet to conserve costs, however, that will not provide much in the way of acoustical control. We recommend spacing baffles 18 inches to two feet apart. Secondly, baffle depth does matter! You need to hit the minimum depth of 12 inches or more to make them effective. Sound can pass through baffles, hit the ceiling, and come back down causing discrete reflections. If you want to treat those reflections, baffles may not be effective unless they are oriented in a particular direction. For example, baffles could channel the sound from one side of the room to another. To resolve this, we recommend you install the baffles in two or more directions in a grid-like pattern. Admittedly, clouds are easier to specify because it is hard to find a place that is NOT a good application. 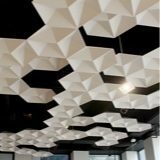 Acoustic ceiling clouds are suspended horizontally, come in a variety of styles, sizes, and shapes, can boost ceiling design capabilities, and hide distracting ceiling fixtures. 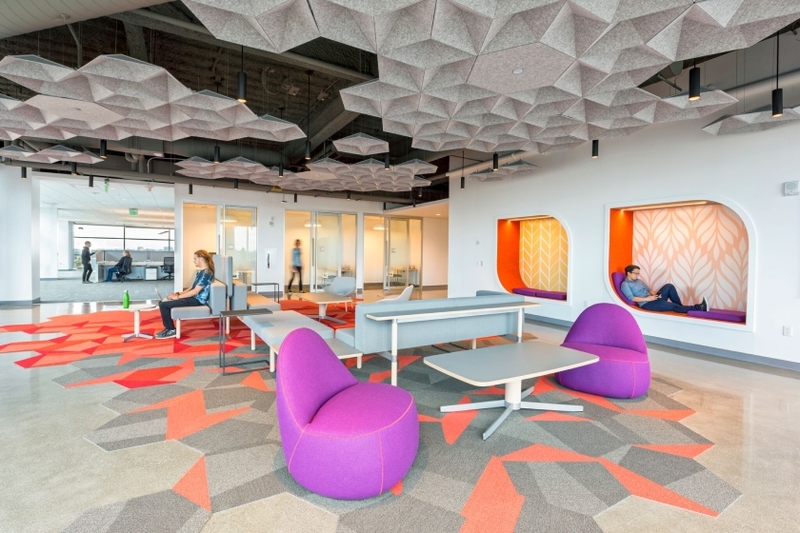 For example, EchoCloud was created with difficult, high-volume ceilings in mind. 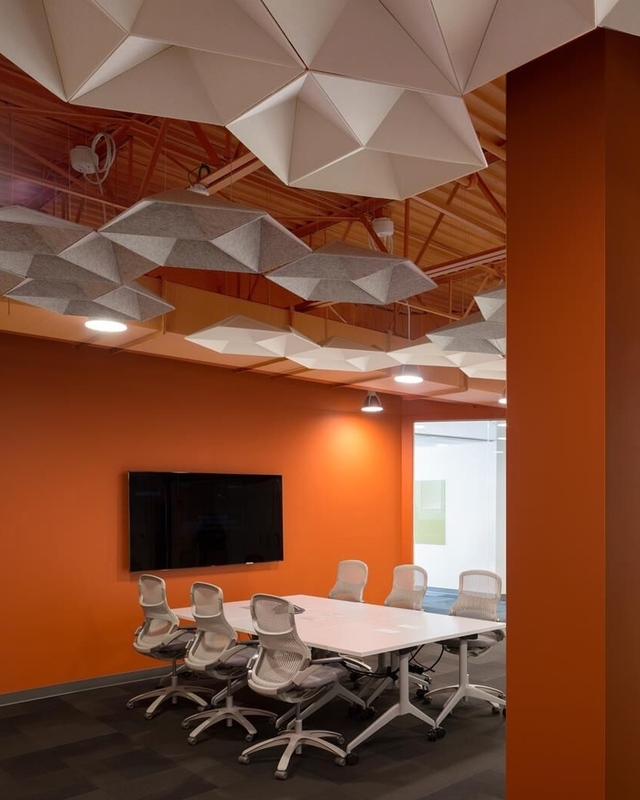 The customizable cloud units help absorb sound within an open space and reduce reverberation, no matter the ceiling type. Ultimately, the height of the cloud is less critical, as it is more important to make sure the clouds fit architecturally. Ultimately, the type of environment will dictate whether baffles or clouds are best. For instance, you’ll likely want to avoid baffles in conference rooms. Microphones on the table will pick up direct reflection vertically from the table and treatment above. Placing clouds strategically over the center of the room and conference table will help focus the acoustical control where it is most needed. 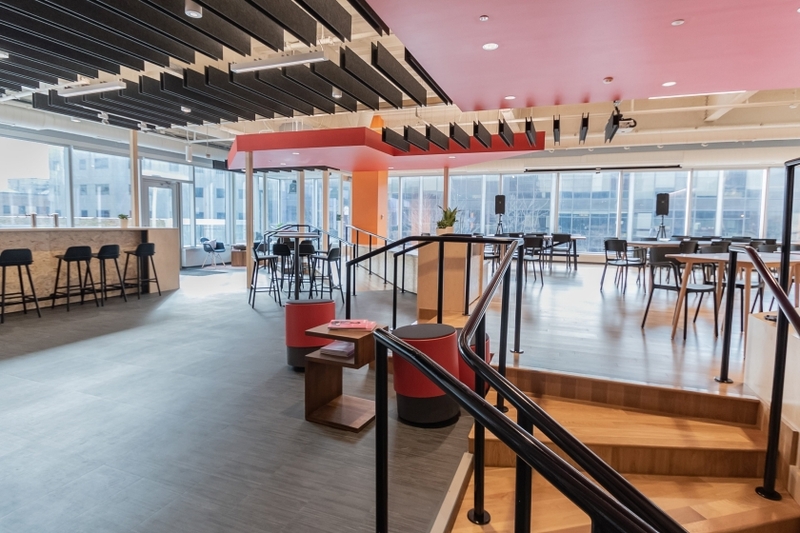 On the other hand, lobbies and reception areas are great candidates for clouds due to having more flexibility with where the sound-absorbing ceiling systems can be placed. In other settings, there may not necessarily be a right or wrong option. Rather, the decision between baffles or clouds may simply come down to which complements the design scheme best. In a bustling cafeteria, it’s all about quantity; the more acoustic products the merrier. Open offices are a prime example where all treatments are going to be useful as well, because one of the main issues with low or no partitions is managing privacy. Remember, the ceiling is strategic and the primary starting point, but don’t stop there! 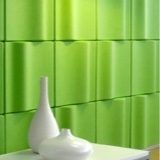 The walls may also require acoustic treatments in order to achieve ideal sound levels. Contact your Kirei rep for help in deciding whether baffles or clouds are best for your project! Interested in receiving samples of any of the above baffles or clouds for your own project?